#2,463 Rolling Pins. 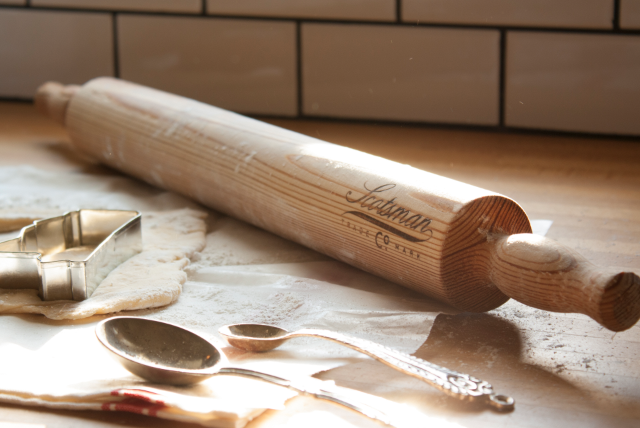 – Laurel Mercantile Co.
Now reading: #2,463 Rolling Pins. When I was little and my parents would take an overnight trip, I would be dropped off at Mammaw and Pappaw’s house for a spend-the-night. I was so clingy to mama and would cry and cry as they were pulling out of my grandparents’ driveway, but Mammaw knew the magic words. She knew I didn’t have much of a sweet tooth, so would make a batch of pie crust from scratch. We would cut the cold butter and shortening into the flour, and she always knew the exact measurements needed without measuring or referencing a recipe. She would take her old rolling pin, saturated to a deep whiskey brown in decades of shortenings and oils, and teach me how to roll it out—not too thick, not too thin. We felt limited by cookie cutters—instead, she gave me toothpicks to draw and cut out the shapes my heart desired. We would bake them on a sheet, sprinkled with a dash of Dixie crystals. I think about them every time I make dessert. I wish I had a pie crust cookie right now, golden brown, in the shape of a football or maybe a duck. Ben’s been hard at work creating new prototypes for when the Mercantile opens, and today we added heirloom reclaimed rolling pins to the online store that remind me for the world of my spend-the-nights at Mammaw’s house. It’s a pre-sale for now to gauge interest, and if y’all really like them, we’ll make a bunch and carry them in the store. We’re interested in selling the things you keep forever. The heirloom tools for home and the kitchen, each one telling the story of our families. This one is the first of many to come! #2,464 The Last Demo Day.